Thai Chicken Sate with Peanut Sauce - Thai chicken sate is tasty and popular. 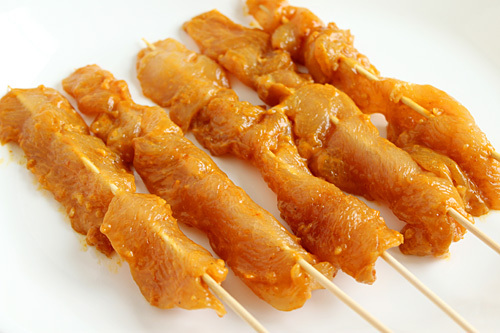 Make this amazing chicken sate with this super easy and step-by-step recipe. Every summer, when I host BBQ parties, I would always have satay for my guests. My favorite is chicken satay. It’s hard not to fall in love with satay—skewered of marinated meat (chicken or beef) grilled over fire, and then served with a savory peanut dipping sauce. The combination is just brilliant. While I make Malaysian-style satay most of the time, for examples: chicken satay and beef satay, I also love a good Thai chicken sate, which is marinated with coconut milk and fish sauce, two key ingredients in Thai recipes. Unlike its Malaysian counterpart, Thai sate tastes milder and less complex in taste, pretty good nonetheless. This is my Thai chicken sate with peanut sauce recipe, adapted from a cookbook. Try it out and I am sure you (and your guests) would absolutely welcome a skewer or two, or three freshly grilled sate with the creamy peanut sauce. Thai Chicken Sate with Peanut Sauce – Thai chicken sate with peanut sauce. Make these at home with this easy recipe-much cheaper, delicious, and you can have as many sticks as you want! Slice the chicken breast across grain with at least 1 inch wide each piece. Mix in the Marinade and make sure all pieces are well coated. Marinate the meat for at least 30 minutes in the refrigerator. Prepare the peanut sauce by adding all the Peanut Sauce ingredients in a 2 quart sauce pan. Mix well and cook on medium heat. Stir the sauce while cooking. Turn off the heat when the sauce is slightly thickened. It takes about 10-15 minutes. Take out the marinated chicken from the refrigerator. Insert the wooden skewers through the meat lengthwise. Grill the Sate for 4 minutes on each side or until desired tenderness. Serve with Peanut Sauce and some sliced cucumber. You can find Masaman curry paste in a pack at any Asian Grocery Stores. All photos and recipes on Rasa Malaysia are copyright protected. Please do not use the photos and recipes without prior written permission. If you wish to republish this recipe, please rewrite the recipe in your own words instead of copy and paste and link back to http://rasamalaysia.com/thai-chicken-sate-with-peanut-sauce/. Thank you very much! I’m Cambodian but I love Thai sate. Yours looks delish must try. I want some of these right now! Love sate…and types actually :) Now if only I had a bbq grill! Joey – now you have the perfect excuse to get one! How about Indonesian? :) Everyone loves my mom’s chicken satay and that’s what we always make at bbqs too. No hamburgers and hot dogs for us! Why choose? I love them both! 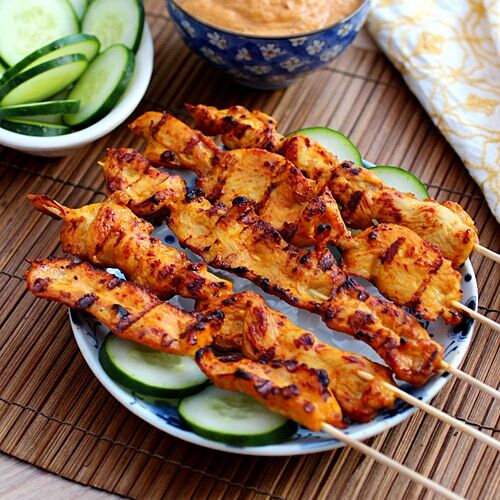 Agree…indonesian chicken satay is the yummiest…. Thai sate is good. But Indonesian the best satay. Hmmm yummy…..
i like Indo and Malay sate,Thai not so much! Thai for me……this is a monthly regular in my household. Great stuff, although my missus uses red curry paste and grinds all the peanuts herself for the sauce…no peanut butter for her! No preference, I love anything Satay, yum. Made satay a few times. Just returned from blue elephant culinary training in bangkok. Hower as a peanut allergic person i had to replace them with cashew nut paste. But it still worked wonders. Also made this a few times with tahini (sesame paste) and had decent results. I dont know how to get Masaman curry paste and also Fish sauce in any place outside Malaysia or Indonesia as it is not well known name and we dont know from which ingredients it is made from.Could anybody explain what it is called in other places like USA,Canada or even UK and how to get it.I lived in Indonesia and use to like satay very much but I could not get the recipe for Peanut sauce. Made this last night and they were better than I’ve ever had at a Thai restaurant. Have leftover peanut sauce which I’ll get creative with. Thanks Salty for trying my Thai chicken sate recipe! Also I substituted apricot preserve for the tamarind juice and the added sugar. Bee!, I have both green and red Mae Ploy Curry Paste in the fridge, can I use either instead of the Masaman? Use the red curry don’t use green curry. Made the satay for a BBQ last night, was a huge hit! That’s awesome so glad that my Thai chicken sate with peanut sauce is a huge hit. What is sweet soy sauce? Is it like Japanese Ponzu? No, sweet soy sauce is soy sauce that has been sweetened. You can get it at Asian stores or online. How long can i refrigerate the marinated chicken? I’m fusing your recipe with an Indonesian recipe from a 1970 Pacific and S.E. Asian cookbook that I’ve come to love and trust. I have been to a few places today sourcing fresh ingredients. Funny that the one recipe calls for Japanese soy, molasses and ground Malay laos root. American food may be a little mixed up, but Asia Pacific food is downright schizophrenic, and I love it like that. 50 people are getting fed satay tomorrow. Wish me luck. Good luck Neil I am sure it will turn out great. Would love to see the Malayasian recipe to compare the two. What do you reccommend when a recipe calls for Asian curry powder? I made your chicken satay today. I did not have lemongrass, which was a bummer. My five and seven year old LOVED it! A major win for mom. Thanks for the recipe. Even better than take out! Hi P-Town, thanks for trying, yes this Thai chicken sate is great. Any substitute for the tamarind juice? I don’t think it was listed on the ingredient list! Is it okay to omit? Thanks, can’t wait to try this! Just made the marinade. This marinade tastes very salty. Once the chicken is cooked, does it taste salty? No, it shouldn’t, especially after dipping with peanut sauce. I got confused with the two satay recipes. I ended up using the Malaysian satay marinade and Thai chicken sate peanut sauce. My husband and I enjoyed the combination. Thanks for sharing both recipes!! That’s great, I am happy that you guys enjoyed the chicken sate and peanut sauce. I must say… THANK YOU! Thank you for the excellent receipe! I couldn’t get any galangal, but it worked out fine without it. Any substitute for tamarind sauce? Can Garam Masala curry powder be used instead of paste and crunchy peanut butter?